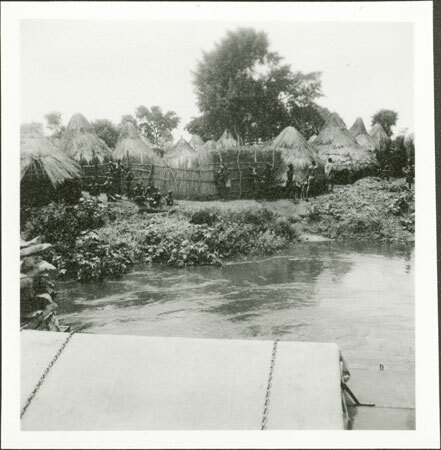 Looking towards a group of people gathered near a homestead on the riverbank almost certainly of the Baro River from the deck of a barge steamer. Although the exact location is uncertain, Evans-Pritchard mentions that he observed the Baro Anuak living almost wholly on the southern, Ethiopian bank, only from the deck of a steamer, stopping at villages briefly only twice. He probably traversed it as far as Gambela judging by the landscape of winding channels and plains. Notes on print/mount - "78 291"
Morton, Chris. "Anuak on Baro riverbank" Southern Sudan Project (in development). 03 Jan. 2006. Pitt Rivers Museum. <http://southernsudan.prm.ox.ac.uk/details/1998.342.155.2/>.